Clydesdale Western 1st XI know that a win against Dundee Wanderers at Titwood (1.30pm PB) on Saturday and a positive goal difference will clinch the Women’s National Division One title. Wanderers 2-2 draw with champions Edinburgh University on Sunday has given a huge chance to ‘Dale Western who, prior to that result, had beaten Watsonians and Grange EL over the weekend. Those results have left the L1s level on points with a game to go, but lead Edinburgh Uni due to a six goal advantage in the goal difference stakes. Clydesdale Western will have to negotiate past the tough assignment of beating Dundee Wanderers – who they lost to in the season’s first meeting at Dalnacraig from a 3-2 score line. Then the L1s will be hopeful that Uni drop points or do not score a bucket load of goals should they win against their opponents for tomorrow in Hillhead (a 3.30pm PB at Upper Windyedge). Wanderers are also still in the hunt to win the league, but would require to a win against Clydesdale Western followed up by a Uni loss to Hillhead. A result which is probably unlikely given the students 7-2 win against Hillhead back in October. 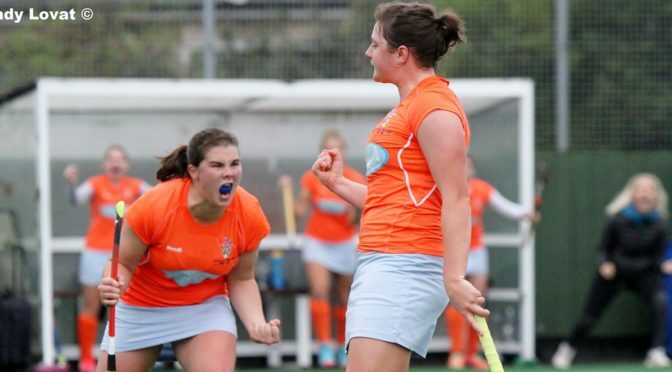 Clydesdale Western 1st XI – sitting top of Women’s National Division One by six goals – will be hopeful of a win against Wanderers and the result between Edinburgh University and Hillhead going their way. Team news for their clash against Wanderers sees Clydesdale Western at full strength – including Jen Eadie, who only managed one game last weekend due to her wrist injury recovery. Naomi Harkness continues to keep her place in the 1s following excellent performances against Watsonians and Grange EL. Heather Lang – who already has 23 goals to her name for the club this season – will also be involved. Clydesdale Men’s 1st XI will complete their season in Men’s National Division One this weekend if they beat already relegated Gordonians at Titwood on Saturday from 3.00pm. Uddingston’s 5-1 win over Hillhead on Thursday night ended the M1s hopes of a top four finish, but they could still be dragged into the bottom four relegation Play-Off spots. ‘Dale are sitting in sixth place in MNL 1 and a win against their Aberdonian opponents would avoid them potentially dropping into seventh place – given Clydesdale already lead Hillhead by a point with a game each remaining. The Titwood boys could also catch Edinburgh University in fifth, but would require a win against Gordonians and the students not to win their remaining two games over the weekend. A win for Clydesdale Men’s 1s will guarantee their safety from a bottom four Play-Off spot in Men’s National Division One. Ciaran Crawford is able to recall veteran Graham Dunlop, Andy McAllan and David Clark back to tomorrow’s squad. Aidan Black, Steven McKnight, Ewan Fraser and Ben Galloway are all unavailable. Clydesdale Men’s teams, apart from the M1s, are all away, whilst the ‘Dale Western teams, like the L1s, are at home. The L3s are on first from noon at Titwood against Uddingston 1s in Women’s Championship Division One. A win for the home side would strengthen their position in fourth place but also give the L2s – who play at 4.30pm against Waverley Inveresk Trinity 1s – a chance to further strengthen their own position in second place in the same league. The Men’s card of games starts as early as 10.30am, when the M3s play away to Uddingston 3s. Then the M2s and M4s are away at Glasgow Green, with the M2s featuring first from 1.30pm against Kelburne 2s in their final game of the Men’s Regional Division One season. The M4s finish Saturday’s card of games, like the L2s, with a 4.30pm PB against Kelburne 5s.